Glasgow City are not expecting any surprises when they face an Arsenal side with plenty of Scottish input in the Champions League's last 16. 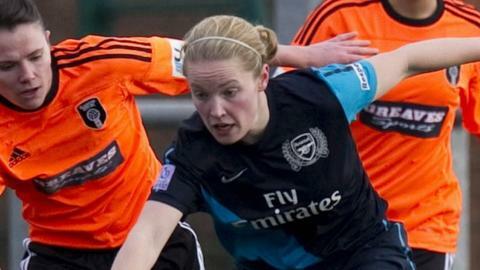 Kim Little, Emma Mitchell and Caroline Weir are in an Arsenal squad managed by former Scotland defender Shelley Kerr. Glasgow coach Eddie Wolecki Black said: "Shelley will be meticulous in her planning. They're always well-prepared. "We're not too dissimilar in how we want our teams to play, so I don't think there will be too many secrets." Kerr, a 44-year-old who had previously managed Kilmarnock, Hibernian, Spartans and Scotland Under-19s, took charge of Arsenal in February. Mitchell, 21, who has made a switch from defence to an attacking role with Arsenal, started her career with Glasgow and joined German Bundesliga outfit Essen in January before being recruited by Kerr in the summer. Weir left Hibernian for London at the same time, the 18-year-old leaving the Edinburgh club shortly after making her Scotland debut. Fellow midfielder Little is the best known of the international trio, the 23-year-old having become a stalwart of Anna Signeul's Scotland squad since transferring from Hibs in 2008. "I know the manager well and there are a few Scottish players at Arsenal," continued Wolecki Black. "I think Kim is regarded as one of the best players in Europe - there is no doubt about that. "But, rather than individuals, I think Arsenal focus on a team ethic - they have potential match-winners all over the park. "It's a very tough away tie in Europe and we can't lose track of that and get caught up in all of the razzmatazz of it being a cross-border game." Despite having just won their seventh domestic title in a row and Arsenal having lost theirs to Liverpool, Glasgow go into the two-leg tie as underdogs. The Scottish champions are ranked 15th in Europe, but Arsenal are third, were European champions in 2007, and have reached the quarter-finals in their previous 11 appearances in the tournament and the semi-finals in the last three occasions. Glasgow have never reached that stage and were hammered 17-0 last season by Turbine Potsdam, presently ranked second in Europe, when making the Scots made first-ever appearance in the last 16. "This is one of the biggest games we've ever had," said the Glasgow coach, whose side lost a friendly against Arsenal 4-2 in February. "Arsenal are seeded number four for a reason. They are one of the best teams in Europe. "The challenge doesn't get any greater than this. "We are huge underdogs and we will treat them with a lot of respect." Wolecki Black is hopeful that his players have learned from that nightmare performance against the Germans, when the Scots suffered a 10-0 first-leg humiliation as they froze in front of the television cameras. "It's important that we are still in the tie ahead of the second leg," he stressed.